September 6, 1918 – The first mail between New York and Chicago to be delivered by airplane arrives in Grant Park at 7:04 p.m. as Max Miller of the United States aerial mail service lands his plane at the end of a trip that took 23 hours and 55 minutes. Thousands of people are in Grant Park attending the “France and Allies Day,” at a war exposition commemorating the anniversary of the first battle of the Marne. Pilot Miller hands over the mail sacks to Captain B. B. Lipsner, the superintendent of the United States aerial mail service, and less than 90 minutes after the plane lands, the editor of the Chicago Daily Tribune receives a letter from Henry Woodhouse, a member of the board of governors of the Aero Club of America. It reads, “This epoch making first trip of the New York-Cleveland-Chicago aerial mail line affords us a splendid opportunity to express our hearty appreciation of the energetic and patriotic efforts that you and THE TRIBUNE have been making on behalf of national preparedness and to develop the aerial service.” [Chicago Daily Tribune, September 7, 1918] Pilot Miller has never landed in the city before but makes a “perfect descent” and is “cheered by the crowds lining the field and by the people who packed the Monroe street viaduct.” Regular air mail service between New York and Chicago will begin in October with letters mailed in New York scheduled to reach Chicago ten hours later with relays of flyers stationed 150 miles apart ferrying the mail between the two cities. 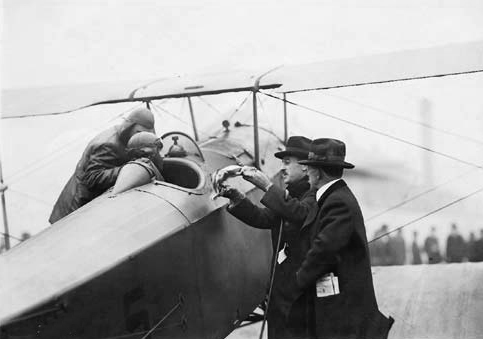 In the above photo Superintendent of the Air Mail Service Benjamin Lipsner, with American flag in hand, passes it to airmail pilot Max Miller prior to an airmail flight in November 1918.